My 10 year old daughter reads the creepy and scary books I have featured on this page and she loves them! 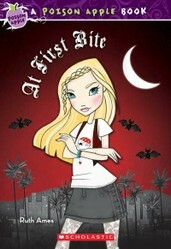 She began reading these books about a year ago starting with the My Sister The Vampire series. She enjoyed those books so much that we found other series that had similar dark and scary themes and she enjoyed those books as well. She has even loaned some of these books out to her friends and they have liked them, too. My daughter is not a Goth girl or anything, but she does like wearing skull t-shirts and she had a Pink Skull Party for her 9th birthday. So, maybe she does have a bit of darkness in her somewhere. The children's book series on this page include My Sister The Vampire, Bedeviled, Supernatural, Poison Apple, Creepover and Monster High. If your daughter enjoys this genre as well and is too young for books such as Twilight, I highly recommend these books for girls age 8-12. Find out what happens when you discover that your twin sister is actually a vampire! This book series is based on long lost twins Olivia and Ivy. Olivia and Ivy are identical twins. Olivia is a cheerleader while Ivy is pale and dresses in all black. They decide to switch places and Olivia soon discovers that Ivy is really a vampire. Not only that, she is not the only vampire in town! This book series follows Olivia and Ivy's creepy, vampire adventures as trouble begins and truths are exposed. What would you do if you found out that your Dad was really a Devil? The Bedeviled book series is written by Shani Petroff. There are four books in this series including Daddy's Little Angel, Love Struck, Careful What You Wish For and The Good, The Bad and the Ugly Dress. My daughter has read them all and I think this series ended up being her favorite. I even contacted the author to see if she has plans to write more books in this series. The plot of these books centers around a girl named Angel who finds out that her Dad is really a Devil. He wants to be a part of her life again and offers to use his special powers to give her anything she wants. Does she accept his offer and sell her soul to the Devil? And, what happens when she finds out that she has Devil powers, too? Are You Ready for a Creepover? Creepover is the latest book series my daughter has started to read. We saw the book offered in her scholastic order and she decided to give it a try. These books are written by P.J. Night and they combine the fun of sleepovers with the thrill of scary stories. There are currently four titles already released in this series with three more scheduled to be released the end of this year and in 2012. The Creepover books include Best Friends Forever, There's Something Out There, Ready for a Scare?, You Can't Come in Here!, The Show Must Go On!, No Trick or Treating and Truth or Dare. Sleepovers will never be the same again! Poison Apple books are written by various authors. These creepy books cover a variety of dark topics such as vampires, the supernatural, ghosts and werewolves. The Poison Apple books currently available include The Dead End, At First Bite, This Totally Bites, Miss Fortune, Now You See Me, Midnight Howl, Her Evil Twin and Curiosity Killed The Cat. Supernatural books are written by Elizabeth Cody Kimmel and they cover creepy topics such as spirits, ghosts and the living dead. The stories revolve around 13 year old Kat who has the ability to talk to the dead. The book titles currently available include Crossing Over, School Spirit, Scaredy Kat and Unhappy Medium. What would you do if YOU could talk to the dead? Which of the following book series have you (or your daughter) read?